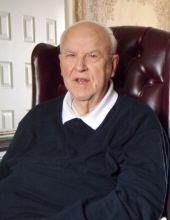 Thomas R. Leimer, 91, of Slater died Sunday, January 6, 2019, at Mary Greeley Medical Center. Visitation will be Friday, January 11, 5:00 p.m. - 7:00 p.m. at Soderstrum Funeral Home, 312 Main St., in Slater, Iowa. Funeral Mass will be Saturday, January 12, 10:30 a.m. at St. Thomas Aquinas Catholic Church in Ames, Iowa. Thomas Raymond Leimer was born on May 17, 1927 in Hancock, Michigan, to Raymond and Marcella (Hild) Leimer. He married Rachel L. Fralick on June 14, 1952, in St. Paul, MN. Thomas and Rachel had been residents of Slater since 1965. Tom graduated from St. John’s University, Collegeville, MN, with a bachelor’s degree and was awarded a master’s degree from the University of St. Thomas. He continued his studies at University of Northern Colorado, Greeley, and in 1961 received his degree in Educational Administration. He taught high school in Minnesota before moving to Iowa to become the principal of Ballard High School, 1965 - 1967. He retired in 1996 after a long career working for the Iowa Department of Transportation in Ames. Tom enjoyed serving his community as well as taking part in several hobbies. He served as Treasurer of the Slater Historical Society, Lieutenant Governor of the Nebraska-Iowa Kiwanis, and as a member of the Ames Woodworking Club. Tom enjoyed building furniture, beautiful household items, and what gave him great pleasure: wooden toys for his grandsons. His creative nature allowed him to construct uniquely designed clocks and display racks that he shared with his sons and daughters. He is survived by one sister, Margaret Thon of Edina, MN; six children, Teresita Leimer, of Cancun, Mexico, Dr. Ann Marie Leimer (Jesús M. M. Garza) , of Fort Worth, TX, Marcella (Steve) Van Oel, of Seattle, WA, Timothy (Lisa) Leimer, of Urbandale, IA, Nicholas Leimer (Amy Glaser), of Kansas City, MO, and Renée (Mark) Cuvelier, of Cresco, IA; and seven grandchildren — Maressa Mayhugh, Matt Cuvelier, Spencer Cuvelier, John Leimer, Joe Leimer, Eric Leimer, and Pete Leimer. He was preceded in death by his mother, father, sister Marcella Leimer Rierdon, and wife, Rachel. He will be laid to rest in the hillside columbarium of St. John’s University in Collegeville, MN, next to his wife, Rachel at a future date. To send flowers or a remembrance gift to the family of Thomas Leimer, please visit our Tribute Store. "Email Address" would like to share the life celebration of Thomas Leimer. Click on the "link" to go to share a favorite memory or leave a condolence message for the family.